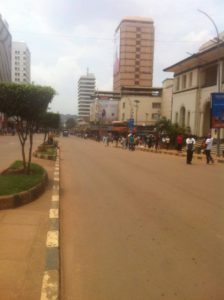 A picture showing a deserted city centre after motorists were blocked from entering the central business district. Photo by Raymond Mayanja. KAMPALA–City dwellers will have to move with extra money this weekend to enable them use boda boda motorcycles thanks to the East African Community Arts Festival that in underway in the city centre. All roads leading to the city centre were closed today morning and will be opened tomorrow evening. Commuter taxis and private vehicles are not allowed in the city centre. Even boda boda motorcycles stop outside the city centre and only pedestrians have access to Kampala Road and Jinja Road. Barricades fully manned by police personnel have been placed on all roads entering the city centre to bar motorists from accessing the central business district. At some point, even pedestrians are blocked and subjected the thorough checks before being allowed into the city centre. One needs at least Shs5,000 to access the city centre from Entebbe Road up from Shs2,000 normally charged by boda boda cyclists. Boda boda cyclists made a killing after taxis were barred from entering the city centre. All this is happening because Uganda is hosting the East African Community Arts and Culture Festival where countries in East Africa will exhibit their products, starting from September 7 to 15. Many city dwellers are not happy with the development, with many complaining that they were not warned in advance. “If I knew, I would gone shopping yesterday but now I have no option but to return home,” Lady driving Premio car was heard lamenting after she was stopped by police personnel from accessing the city centre. Another city dweller, Robert Kaddu, a market vendor also complained that they were not able to get vegetables and fruits from the trucks. “We offload the vegetables and fruits from the trucks in the evening. But today, the trucks didn’t appear because all the roads are closed,” he said. But the traders registered to sell products at the festival are making a killing. They sell mainly ladies’ shoes, men’s clothes, drinks and eats, among others. “By 11am, I had sold almost everything here,” one Wasswa, who deals in beverages, said. The decision to have Uganda host the festival was reached in 2015, Pius Bigirimana, the Permanent Secretary of the Ministry of Gender, has revealed. He said the festival was passed by the Council of Ministers in 2011 as one of the measures through which member states can foster socio-economic development. At least 250 delegates from each of the partner states, including Kenya, Tanzania, Rwanda, Burundi and South Sudan will take part in the festivities. Bigirimana revealed that Uganda was selected because of its natural sceneries, extended heritage, colour and profusion of brilliant life. This includes 65 indigenous tribes with distinguished music, culture and dance. “The events are critical opportunities to sell the potential our beautiful motherland holds. We have, therefore, spared no effort to ensure that JAMAFEST in Kampala becomes one of the most memorable festivals ever held,” Bigirimana explained.